WELCOME TO THE CRAI CAGLIARIRESPIRA 2018 WEBSITE! Here you can find all the useful informations about us and our competition. 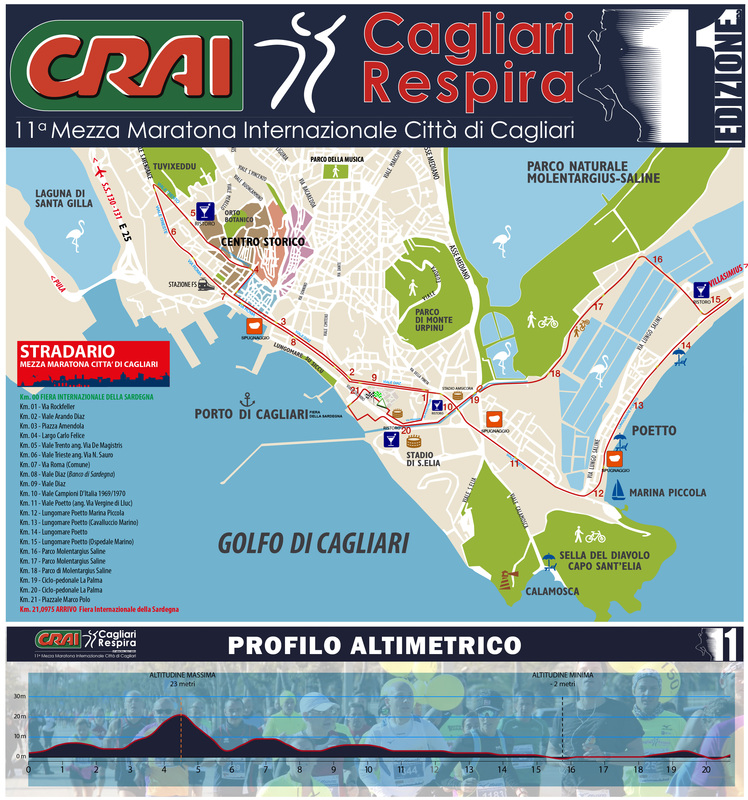 Contact us on Facebook: CRAI CagliariRespira Mezza Maratona Cagliari. Who is the organiser of CRAI CagliariRespira 2018? The ASD Cagliari Marathon Club was born on 2008 with the specific purpose to communicate that SPORT IS HEALTH. The idea became reality 10 years ago with the first organisation of CRAI CagliariRespira, the half Marathon of Cagliari city. Thanks to the increasing interest of medias and international athletes, the competition is one of the most famous sport events in Sardinia: the last year it had around 3000 participations. The message is simple: if you want, you can get your lifestyle healthy by practising sport and following a correct diet. The itinerary of CRAI CagliariRespira half marathon 2018 is organised on a fast circuit composed by one and only urban tour. No cars! Only you, sport and nature! Indeed, the competition is a real Eco-Run structured in a first part, across the storic center, and a second one through the Poetto and Saline. The road, especially in the first part, is in tarmac but there is only 1Km (in the second one) where it’s rural, across the natural park of Molentargius. Useful informations for athlets who run the CRAI CagliariRespira half marathon 2018 or other competitions: KaralisRun 9.9, KidsRun and SeiKilometri. How can I subscribe to the CRAI CagliariRespira 2018 ? It’s very simple. You can subscribe to the competition online using the Enternow website or download the specific form following this link. You can also download the health form for foreign resident here. The departure of the competition is at 10 o’clock into the Fiera Internazionale della Sardegna. The schedule could change for organizational problems. Athletes with special needs will start at 9,55. You’re invited to reach the place of the departure within 9,45. When I arrive in Sardinia, how can I leave Cagliari’s airport and go to the departure of the competition? How can I arrive to the departure of the competition with a car? 3. If you arrive from Viale Poetto, you can leave your car in the square in front of the Sant’Elia Stadium. All the parking are free and opened before, during and after the competition. IMPORTANT: Streets will be closed within 9 o’clock (an hour before the departure).